The original meeting with Jayadvaita Swami took place on Jan 19, 2003. This meeting took place on Jan 26, 2003. 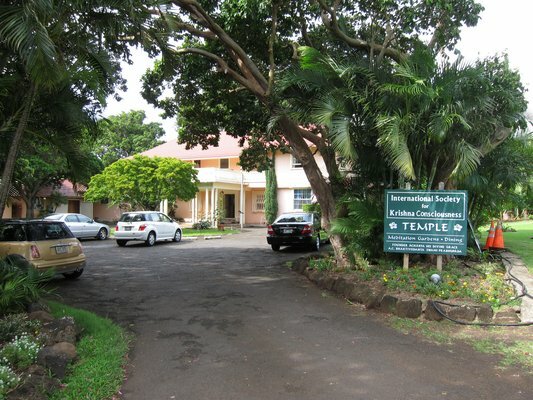 Govinda dasi: When we had the meetings here [Honolulu Temple], one of the things that Jayadvaita Maharaja said was that they [the BBT trustees] did not ever prevent devotees from printing the books. But we had a letter from Dhanistha dasi, she’s an old book distributor. I don’t know her personally, but she wrote a letter saying that she had approached, she called Jayadvaita in 1996 or 95, to print the books, 5,000, she had the money to do it, and she approached in as simple and stupid a way as possible, just like “Please, just for sentiment,” and so forth, and she was refused. There’s some reason going on, that they don’t want Srila Prabhupada’s books. You have these books available, but the BBT newsletter in the temple lobby states clearly that the temples cannot buy from Krishna Books Inc.
Devotee: They can buy them from the BBT, but at higher prices than the changed books. But just for the record, where there’s a will, there’s a way. Govinda dasi: OK, I’ll just go over the notes from the meetings. As you know, we had a series of meetings with Jayadvaita Maharaja: two meetings, actually. And one of the things that we had to make very clear is that this is not a personal issue—that we don’t like Jayadvaita’s writing, or we don’t like his editing work. That really isn’t the issue at all. It’s not how the books were edited; it’s the fact that they were edited. The issue is not—and of course, he took it a bit personally but I think he did understand eventually that that wasn’t our point—that we think he’s a great writer, and he should write and edit many books—but not Srila Prabhupada’s books. They should be left as they are. So that’s the main issue, actually, the main issue. He feels that the 1972 edition is not in keeping with manuscript, which he only has access to, and is not available to anyone else that he knows about. And that’s just not the issue. The issue is that when you write something, even if you have an original manuscript—I’m a writer, and I may have three [versions] in the trash before I print something—but whatever I sign my name to and I print, that is the final edition. That’s what I approve for the world to see. And that’s really the issue here. Srila Prabhupada approved of his Gita. He not only approved of it; he spent ten years lecturing from it. Every verse of the Bhagavad-gita, except for a few verses in the First Chapter, Srila Prabhupada spoke on over a period of ten years. He had ample opportunity to say, “Change this, change this, change this.” But he only requested a couple of changes. There was ‘cattle raising’ he wanted changed to ‘cow protection,’ and I believe there was one other, dhyana-yoga or something like that. Those were very small changes. Govinda dasi: It was mysteriously, that was before, in the early times. Personally, being a writer and an artist, it has always amazed me that somebody could start over from scratch. I think about that sometimes, when I start getting discouraged with some work. Srila Prabhupada started over from scratch: no Xerox copy, no computer. That’s dedication. So anyway, he knew what he was doing. And somehow or other, anyway the issue is that you can’t change books post-disappearance or posthumously. And as we discussed, Keli, Satyahit’s wife, did a lot of research on the word ‘bowdlerizing.’ Bowdler was a fellow that lived in the 16th century or 18th century—it was after Shakespeare—and he was the fellow that changed all the books. The original meaning was expurgated, meaning that he went over Shakespeare’s books, and he changed any passages for English schoolgirls, if they had any risqué parts, he took them out. So when a book is changed posthumously, among the scholarly community it’s called bowdlerizing. It’s sort of like bastardizing, it has that connotation. I have information from a Ph.D., Hari-kanta, she sent me an email stating that it has a bad connotation. And also Dr. John Trimble, the professor of English that I took a course from in 1998. I was unaware in 1998 that the books had been bowdlerized, because I had my own set. I’m like so may other Srila Prabhupada disciples sitting at home with their own sets of books. But unknown to me, my spiritual master’s books had all been completely changed. So when I was in Texas, I went out and got myself a Gita at the local temple. And I opened it up, and I said, “What the hell happened to this book! ?” [laughter] Excuse me; I was in Texas. It didn’t even sound anything like Srila Prabhupada’s Gita. So I went to Professor Trimble, and he explained that it had been bowdlerized. And so, Dr. Trimble was the first person to tell me this word; I’d never heard of it before. So Keli contacted him, and Dr. Trimble wrote a letter back, which is a very interesting letter. Bear in mind that Dr. Trimble wrote Writing With Style. There’s not a writer on earth that doesn’t have this book. There are two [main reference books for writers]—Elements of Style, by Strunk and White, and Writing With Style. Devotee: Without getting into that debate, because then we could be here for quite some time… I don’t want to get into that debate, because by going into that debate, I am violating Srila Prabhupada’s order not to change one word. Srila Prabhupada didn’t care… In other words, to say that we haven’t changed the philosophy… well, we were told that about so many things. To say that “We haven’t changed the philosophy, so that’s alright,” is really a slap in the face to Srila Prabhupada, who specifically said, “Don’t change it.” So what part about, ‘Don’t change it,’ or the word ‘no,’ don’t they understand? In other words, you can come up with all kinds of rationalizations—‘it’s closer to the manuscript,’ ‘we didn’t change the meaning’—you can go on and on. But we have our spiritual master pounding his desk, saying, “Don’t change one word; this is your American disease.” And even now, there’s a discussion that we should start taking out some of the passages that are not politically correct. Satyahit Prabhu: Jayadvaita Swami said that the intention for the future is to write new books adapted from Srila Prabhupada’s teaching. In other words, their plan is not to go on distributing Srila Prabhupada’s books but to adapt the philosophy and write new ones. Devotee: In other words, “We don’t like this, we’ll take out this, we’ll change this, we’ll do that.” So, people can do as they like, just don’t put Srila Prabhupada’s name on it. Srila Prabhupada didn’t write it, Srila Prabhupada didn’t authorize it, Srila Prabhupada didn’t approve it; don’t put his name on it. Put your name on it, and go get your own scholarly reviews, and go get your own devotees to distribute them. As for us, what Srila Prabhupada did is good enough for me, it’s good enough for all the other acaryas, it’s good enough for all the Vaisnava sampradayas on the planet—I’m personally going to stick with that. And if somebody wants to do something different, be my guest. I just don’t want to be there when the Yamadutas show up. Govinda dasi: Bowdlerizing is what happened to the Bible, and Bowdler was responsible for a great deal of what happened to the Bible. I’m not an authority on this, but Keli, Satyahit’s wife, has done a great deal of research on this, and the changes to the Bible—there were many of them made—basically, it’s been bowdlerized. You don’t know me, but I’m a friend of a former student of yours, Bonnie McElroy [Govinda dasi]. She and I are both members of the International Society for Krishna Consciousness. The principal editor of our spiritual master’s books is here in Hawaii promoting his editorial changes, which many of our members are very unhappy with. Bonnie remembers a conversation she had with you a few years ago about bowdlerizing, and after reading Dr. Bowdler’s Legacy: a History of Expurgated Books in England and America by Noel Perrin, I realized that this is what the editors of our spiritual master’s books have been doing. Their rationalization and plea is to correct the grammar and English—supposedly to make it more acceptable to the scholarly community. They have gone farther by changing the meaning through subtle word jugglery. The reason I have written is to ask you, ‘What is the scholarly response to posthumous editing, especially of religious texts?’ Our community is meeting with the editor tomorrow; could you please write me. It would be good to know your response for further discussion. Regularizing the spelling and grammar is one thing; “improving” the meaning is another, especially when such changes aren’t expressly acknowledged. I think the editor should be challenged. At the very least, he should have to justify every “improvement” that isn’t strictly grammatical. The burden of proof is on him, not on you. Now this is from a scholar, the best writer; he wrote the legal encyclopedia. So this guy knows his stuff. So this argument, that ‘We’ve made it more acceptable to the scholarly community,’ just doesn’t fly. The second thing I always like to point out is that 99.99% of all our glorious scholarly reviews are done from the original authorized and approved version, and I don’t that we have more than a handful that are done from the new version. In other words, all of our scholarly reviews—of which there are hundreds—are done from authorized and approved versions, and not from the new ‘better for scholars’ version. Devotee: Because Srila Prabhupada authorized and approved it and as she just said, it’s called arsha prayoga: that the respect for what the spiritual master authorized and approved is such that he tells the disciple, “That’s a snake,” and the disciple sees a rope, he goes, “That’s a snake.” And if he goes later, “That’s a rope,” then the disciple goes, “Oh, it’s a rope.” So we print them as they are, and later on we intend to print little addendums showing some minor corrections. And if they had done this, nobody would object. Just like you were saying, Srila Prabhupada wanted ‘cow protection’ not ‘cattle raising.’ So the solution is to start printing Srila Prabhupada’s authorized and approved books, and if you have a problem with something, put it down somewhere else, or put it in a footnote, put it in an addendum. Print the manuscript that it originally came from, if you want to be so close to the original manuscript, and say, “This is the original manuscript, but this is what Srila Prabhupada authorized and approved. And as Govinda dasi was explaining to me, it wasn’t just that Hayagriva was an English professor and one of Srila Prabhupada’s original disciples, but Srila Prabhupada spent two years with him going over the manuscript. Govinda dasi: Before Jayadvaita joined the movement in May of 1968, Hayagriva had already been working with Srila Prabhupada on the Bhagavad-gita for two years already. I lived with Srila Prabhupada and Hayagriva in Los Angeles. They worked for hours every day. This is before Jayadvaita joined the movement. And so why—the Gita is a song: the Song of God. It’s poetic, beautiful, in Sanskrit it’s actually poetry. Why would Krsna out of the blue send an English professor, a PhD in English, who happens to be a poet, who happens to have the writing style of a Merton and Thoreau, and all of the early transcendental poets? That was an accident, right? He just happened to send in 1966. Havagriva is not the issue. We’re not saying that Haygriva is a pure devotee. That’s not the issue; the issue is that Krsna was sending Srila Prabhupada whatever he needed to do his work. And He sent him a very qualified man to do this editing. I take one example: “The Blessed Lord said.” It’s been changed to “The Supreme Personality of Godhead said.” This is not something that we want to quarrel about. The Supreme Personality of Godhead, the Blessed Lord… but how do we know that Srila Prabhupada and his editor didn’t sit down and discuss this point, and decide on “the Blessed Lord said?” We don’t know that because we weren’t there, and actually, Jayadvaita wasn’t there. It was something that was going on already. Jayadvaita joined in Boston on 1968, like May or a couple of months before. We were in Boston at that time. Gourasundara and Srila Prabhupada and I were staying in Boston for a month in May of 1968, about the time he joined and was working for the press. One day Srila Prabhupada called me in to his room in Boston. He had a Back to Godhead in his hand. He was livid. He said, “Look at this! Look what they have done!” He showed me. I was like, “OK, what did they do?” The Back to Godhead had—and I’ve still got this Back to Godhead—it had a picture of Srila Prabhupada, black and white, and a big statement: “This man has changed the world.” He was very upset. He said, “This, this is the beginning of falldown. To consider, to refer to the spiritual master as a man shows that the consciousness of the disciple does not see the spiritual master correctly. Call them!” So Rayarama was brought on the carpet. So Srila Prabhupada was very on-target about what he wanted. He could see how the consciousness was moving in any disciple. I can remember so many instances. I was really angry about something one day, and he said to Gourasundara, “Govinda dasi is fighting a war.” He could read your mind, from 3,000 miles away, from Krsna-loka away. How about right now? As if we don’t believe he’s sitting right here listening to this discussion. We do. He’s right here, and he’s very happy that we’re defending his books. My concern is this: I just got a Back to Godhead magazine, and it showed a big party in Poland with over 100,000 people: a big festival. 93,000 plates of prasadam distributed. And it had a picture of the book table, and on the book table was not Srila Prabhupada’s Gitas; on the book table was the changed version. And what we have to realize, as Srila Prabhupada’s disciples, is that Srila Prabhupada’s books have almost been lost. Twenty years they’ve been practically out of print. They’ve almost been lost. How serious is this? This is very serious. Probably the most important thing we can do with our lives is to reinstate his books. I believe that historians are going to look at this era, because you know history and historians have a way of bringing things out. All religions have a very rocky beginning, I have been told by scholars. I’m not a scholar myself. But when they look at this era, there’s no way that the political turmoil and all of the strange things that have happened since Srila Prabhupada left can be hidden; there’s just no way. They’re going to look at this era as being the Dark Ages, or like the Vatican Inquisitions, or an era where they fed the Christians to the lions, or—what did they do to Saint Thomas, crucify him upside down? They’re going to look at this era with great suspicion. My concern is, will they know by that time which one is the original Bhagavad-gita? Will they actually know? If this million-dollar lawsuit had not been won, and these books not put back into print, the world would not have Srila Prabhupada’s Bhagavad-gita fifty years from now. That is basically the truth, and that’s a very serious thing. And I think we underestimate; the problem with the movement, with our whole ISKCON, is not really realizing who Srila Prabhupada is, and underestimating who he is. This is the bottom line; this is why these books have been edited. This is why all these things have happened in the way that they’ve happened. And I think in the future, Srila Prabhupada will be recognized more for who he is. Already we have since 1996, when Srila Prabhupada re-entered the society in the form of the Centennial, I think that people appreciate him more. Those of you who lived through the 1978-86 eleven guru days know what I’m talking about. And that’s a separate subject; I don’t want to get into it, I want to stick to the books. But I have a couple of notes here. One of the things is that Srila Prabhupada accepted his books in 1972 as transcendental. As I said, he lectured on every verse in the Gita. And he constantly pushed book distribution and said his books were transcendental. So Srila Prabhupada said that his books were transcendental then, and yet now these same books aren’t good enough, they’re not transcendental? Govinda dasi: And another point is, he never actually gave authority to change his books after his departure. He specifically said, “Any changes should be seen by me.” He says many things [about the book changes], and you should read them, and they will be available on the new web site, www.adi-vani.org. And people will be able to write letters in to email@adi-vani.org. The purpose of this website is to have all the many disciples—and there are batches in Europe, batches in India and all over the world—and they’re not unified. The idea is that they will all write letters. And even if the BBT doesn’t change right now, we want to leave a broad enough band of history, a broad enough volume of work that when historians pore over this in 50 years, and we’re all dead and gone and forgotten—and all of us will be, including the biggest leaders—they will be able to see which books were Srila Prabhupada’s books, and they will be able to see what Srila Prabhupada’s original disciples had to say about the changes. This is what we’re trying to do. It’s not a political ‘right now’ thing; it’s a future thing. Other people have other ideas; this is my idea. But basically, we have to leave enough history that Srila Prabhupada’s books don’t get lost. Because right now, even though they’re printing—they just printed 10,000 Gitas, right?—for the last 20 years, how many millions of the other Gita have been distributed? All over Poland, all over Russia, all over the whole world. So, what will the historians think? That was the original Gita. Of course, there may be three or four more versions or editions by then. So that’ll be just like the Bible. It could easily turn into the Bible, and we don’t want this to happen. So our mood here is we’re just a handful, but there are many, many Srila Prabhupada disciples, sitting in their homes with the Bhagavad-gitas, who are disgruntled and don’t have a forum to speak what they have to say. We want to give them a forum. This is our goal. Govinda dasi: Srila Prabhupada liked the original books and paintings. For the record, there’s a lot of information that’s available to people, where Srila Prabhupada describes that, “The early paintings are full of bhakti; why did you remove them from the books?” He liked the mood. This was, and for those of you who came later, I want you to know that Srila Prabhupada oversaw every step of the production in many, many ways. Devotee: The early paintings have a look of pastel, and the colors of Krsna’s form are so, so attractive. Govinda dasi: They’re full of bhakti. When the spiritual master is present, he has the Midas touch. He touches anything and it’s surcharged with bhakti. He touched us, and we were infused with bhakti. Look at the stuff we did; we were 20-year-old kids, green behind the ears. It was because his energy was working through us; he was using us, we were willing warm bodies, and he guided us from within, he guided us from without, he watched over us, and he was over our shoulder. For example, that original purple Gita, I was staying with Srila Prabhupada in LA, and I drew the cover picture for it. He would come shuffling into my room and look over my shoulder while I was drawing the picture. Macmillan cut the book down; he didn’t like that. He wanted it to be with all the purports, so the next one was. So he wasn’t happy with the fact that they wanted not so much repetition. And then so far as the Teachings of Lord Caitanya, you mentioned that earlier, because that’s going to be on the press next. That book, we did the drawings while we were living with Srila Prabhupada. Srila Prabhupada described how the drawings should look. We were very poor in those days, so we didn’t do full color; we did black-and-white drawings. Srila Prabhupada was working through us all, and the people who came to think that ‘I am the doer’ and ‘I am doing this’—and I know a few, and they’re not around anymore. One of them was my ex-husband. Srila Prabhupada said, “He suffered from too much intelligence.” He left because he was brilliant. He thought that he knew more than his guru. Srila Prabhupada said, “He’s suffering from too much intelligence; he thinks he knows more than his guru.” He was brilliant, there’s no question; he wrote books at 21 years old. But that doesn’t cut it. Srila Prabhupada came from Krsna-loka to write some books, print some books; and the fact that they have been altered is the worst thing that could happen. Everything else will be lost in the wash, but his books… He used to say that “Even if we lose all the temples, you have my books.” But we don’t have his books. My point is, his books have been—until the past year—completely lost, except in my bookcase, and so forth. So this is a very significant thing, that he oversaw the production with the artists and the writers, and he infused the work with his own bhakti. That’s why those early writings and those early paintings are so… shining. I look at this painting, and I don’t know how I did it. I look at that one, and I don’t know…[note: Srila Prabhupada’s room in New Navadvipa is decorated with several paintings done by Govinda dasi and other artists directly under Srila Prabhupada’s supervision.] I don’t have the same mood now; I think none of us really do, as we did while Srila Prabhupada was present. So he saw the American disease of changing things, and he talks about it in a number of different places, that “The American disease is that they will try to improve and they will change.” One time, one devotee came here, and Srila Prabhupada gave him like an hour’s instruction—I was in the room—how he should do deities. He wanted Gour-Nitai deities. And then at the end of it, he said, “My wife wants to make silk. Can we kill the silkworms?” You know, you’ve got to douse them at the end. And after he left, Srila Prabhupada was shaking his head. He said, “These American boys. Next they will be asking me if they can kill cows to make mrdangas!” Because he was disgusted with this American disease of always wanting to change things and ‘improve’ things. And he reached the point where, toward the end—and you can see around the 1976 letters in all this material that we have—he basically said, “No changes.” Because if he gave them an inch, they would take a mile. Which is why, even though there may be some so-called ‘imperfections’ that you may claim that scholars may see, it’s better not to make any changes because the temptation of a barber is to cut too much hair, and the temptation of an editor is to clip too much or to change too much. Govinda dasi: One of the points that I really want to make here is that Srila Prabhupada did oversee his work. He really did; it wasn’t like it was just going on. Even the Caitanya-caritamrta, he was on top of it every moment of the day. Srila Prabhupada got up at two in the morning, and started his translation work. His book work was the most important thing he was here to do. And he kept saying that. So he did watch over it. And things were close, like a family in 1966. They were very close in ’67, ’66, there were only a handful [of devotees], and we would sit around in Srila Prabhupada’s quarters in the evening. We were like small family in New York, and we would talk. And so he would have very close direct contact with all of us. And that contact he had with Hayagriva, he was working on the manuscripts, it wasn’t like later when you had to make an appointment to see Srila Prabhupada; you walked into his room, and in and out all day long! And he sat with you and talked with you and worked with you. This was what the Bhagavad-gita was born amongst, this was how it was edited. So Srila Prabhupada worked closely to get the books like he wanted them, and even if there were a few so-called ‘errors,’ they were still acceptable to him. And as I said, the underlying danger here is the one, the core danger here is seeing Srila Prabhupada as an ordinary man. This is the greatest danger, and I mentioned that ad [in an early Back to Godhead magazine], and after he left in 1977, a decade of forgetfulness ensued. And in this era, many mistakes were made and many wrongs were done, and there was a confusion surrounding his whole disappearance and everything really kind of fell apart. And those of you who lived through this know that it is true. 90% of Srila Prabhupada’s disciples either left or were forced to leave. In 1996 Srila Prabhupada began to enter back into the center of ISKCON, with the Centennial, and simultaneously with the winning of the court case, his original books started coming out again, so that his work will be preserved. So my concern is that in 50 years, what will history see? If we allow the gate to be opened for the changes, they will go on. There are already indications that they’re thinking of making other changes. Bhaktisiddhartha Prabhu: There’s a forum on COM that discusses proposed changes to Srila Prabhupada’s books. The major theme that they’re discussing is ‘the removal of sexist and racist language.’ They’re talking about removing whole sections of Srila Prabhupada’s books. Tejo-prakash Prabhu: Jayadvaita told us when he was here that nothing has been changed in the Srimad-Bhagavatam. Govinda dasi: That’s not true. Bhaktisiddhartha Prabhu: There are thousands of changes. Tejo-prakash Prabhu: So where’s their credibility?